Following surgical resection of brain metastases from solid tumors, adjuvant stereotactic radiosurgery (SRS) is increasingly used instead of whole-brain radiation therapy (WBRT). We report 2 cases of subcutaneous recurrence along the surgical tract following craniotomy and SRS for solid tumor metastases, along with a review of the literature. There was no evidence of extracranial disease in either case. A 56-year-old man with a background history of transitional cell carcinoma (TCC) of the bladder had been treated with cysto-prostatectomy and adjuvant chemotherapy in 2017. He presented 1 year later with headaches, ataxia and visual disturbance. Examination revealed a right homonymous hemianopia. Contrast-enhanced magnetic resonance imaging (MRI) of the brain showed 2 enhancing lesions of the left occipital lobe (Figure 1A ) and left cerebellum, measuring 2.5 cm and 2.6 cm, respectively. 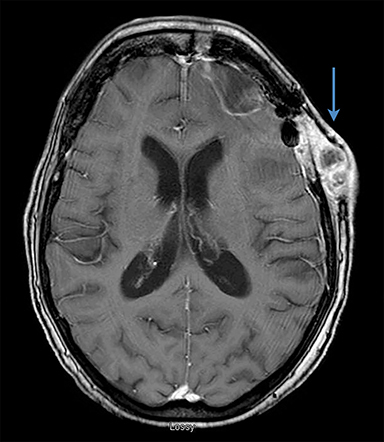 He underwent craniotomy with a postoperative brain MRI showing complete resection of the left occipital lesion (Figure 1B) and an 80% resection of the left cerebellar lesion. Pathology was consistent with metastases from TCC. He was treated with adjuvant SRS to the resection cavities to a dose of 24 Gy/3 fractions prescribed to the 80% isodose line with a 2-mm planning target volume (PTV) margin (Figure 1C). At a 3-month follow-up, the patient reported worsening ataxia and an increasing subcutaneous mass at the occiput. Investigation with contrast-enhanced CT showed multiple cystic metastases within the cerebellum as well as subcutaneous deposits along the surgical tract consistent with surgical tract recurrence (Figure 1D). He was treated with salvage WBRT to a dose of 30 Gy/10 fractions but died shortly after. An 80-year-old woman with a prior history of 2 primary malignancies: 1) a non-small cell lung cancer (NSCLC) (adenocarcinoma) treated with SBRT to the lung in early 2016 followed by chemoradiation for early mediastinal nodal progression the same year, and 2) a clear-cell renal carcinoma treated with nephrectomy in 2016. Two years later she presented to the emergency department with new onset confusion. 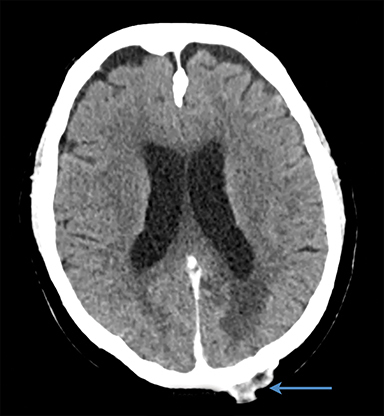 Contrast-enhanced computed tomography (CT) and brain MRI revealed a solitary left frontal enhancing mass with surrounding vasogenic edema (Figure 2A). She underwent frontal craniotomy with gross total resection of the tumor (Figure 2B) and completed adjuvant SRS to the resection cavity to a dose of 30 Gy/5 fractions prescribed to the 80% isodose line with a 2-mm PTV margin (Figure 2C). Pathology was consistent with a metastasis of lung origin. She presented 3 months later with an enlarging scalp lesion. 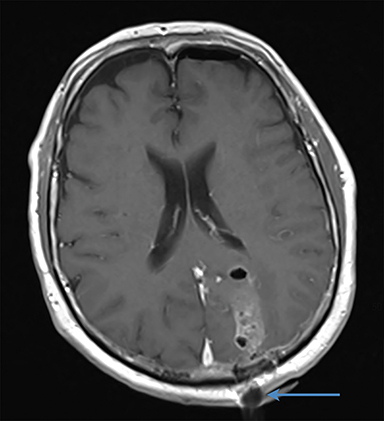 Investigation with contrasted-enhanced CT and MRI confirmed subcutaneous disease along the craniotomy site (Figure 2D), with further intracranial parenchymal progression in both frontal lobes for which she was asymptomatic. There was no extra-cranial disease on positron emission tomography/CT (PET/CT). Biopsy of the scalp mass was thyroid transcription factor 1 (TTF-1) positive consistent with local recurrence of NSCLC following craniotomy. She was treated with salvage WBRT with bolus over the skin lesions to a dose of 30 Gy/12 fractions. She has stable disease on follow-up and is due to commence treatment with pembrolizumab. Until recently, postoperative WBRT has been the standard of care for patients with resected brain metastases. This was based on 2 landmark trials by Patchell et al showing improved intracranial control and lower rates of neurologic death when compared with either modality alone.1,2 With a WBRT technique, however, irradiation of large volumes of normal brain tissue results in deterioration in medium and long-term neurocognitive function and quality of life.3-7 Postoperative surgical cavity SRS has the potential benefit of allowing delivery of high doses to the target and sparing healthy brain tissue. 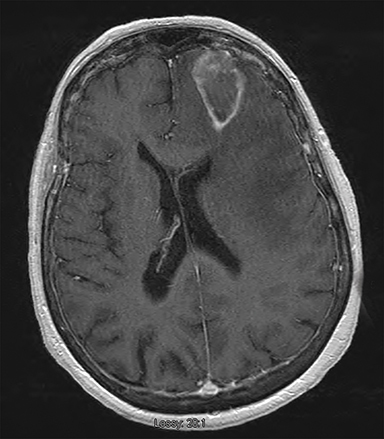 When compared to postoperative WBRT, surgical cavity SRS results in increased rates of distant intracranial recurrence (including leptomeningeal recurrence) and also unexpectedly worse local control in some studies,7,8 yet the lack of an observed difference in survival has meant that adjuvant SRS alone has been adopted in many centers. The assumption is that patients will be offered salvage treatment at failure, thus deferring or potentially avoiding WBRT and its associated toxicities altogether. When considering treatment options, however, it should be remembered that intracranial disease progression is also an important cause of neurocognitive decline.9 In addition, survival is often determined by systemic disease burden and so may not be the most relevant endpoint in assessing the impact of local therapies on intracranial disease. As patients are living longer with better systemic and targeted treatments, it becomes increasingly important to strive for both durable intracranial control and reduced treatment-associated cognitive toxicity. With SRS delivering higher biological doses to the resection cavity compared to WBRT, it seems counterintuitive that local control could be worse with an SRS approach. One hypothesis is that the target definition of the cavity is complex with high rates of interobserver variability when compared to the targeting of intact brain metastases. To help standardize this, Soliman et al published a consensus contouring guideline for completely resected metastases earlier this year.10 The study is an expert consensus and not based on patterns of failure analysis. The authors highlight the importance of including meningeal and venous sinus margins within the clinical target volume (CTV) when these structures were involved on preoperative imaging. They also advise that the surgical tract should be included for deep-seated tumors, but do not advise expanding this to include the tract within the skull and subcutaneous tissue. In the cases presented here, both patients had limited intracranial disease with no evidence of extracranial disease and were treated as per current standard with surgical resection followed by cavity SRS. There were no identifiable postoperative complications (bleeding, infection, meningocoele) in either case. The CTV included the surgical cavity and tract out to the meninges and did not extend beyond the boundaries of the inner skull table. Following the publication by Choi et al in 2012,11 we have used a 2-mm PTV margin for all postoperative cases in our center. Figures 1C and 2C show the SRS treatment plans with the prescription isodose line in green. The craniotomy tract also is visible on these images and is not included within the treatment volume. Cutaneous metastases have been described for many solid malignancies and usually represent late disseminated disease. On the other hand, direct subcutaneous tumor seeding following craniotomy for solid tumor metastases is quite rare. We have identified only 3 case reports in the literature, all of which used SRS to treat the cavity.12-14 This pattern of failure has not been described following postoperative WBRT. The patient in our second case had a history of NSCLC and renal cell carcinoma (RCC), and had a biopsy of the subcutaneous lesion confirming that this was most consistent with direct tumor recurrence of NSCLC after a craniotomy as opposed to cutaneous metastasis from RCC. It is worth highlighting that neither of our cases received systemic therapy following initial treatment of intracranial disease and it is possible that this may have reduced the risk or at least delayed the development of tumor recurrence at the scalp. We present 2 cases of direct scalp seeding following craniotomy and cavity SRS for intracranial metastases from solid malignancies. This is a pattern of failure that has not been described following WBRT. The theme in both the clinic and trial settings is one of a local therapy approach, accepting the increased risk of intracranial and leptomeningeal failure, with delay or avoidance of WBRT. For patients with resected brain metastases, progress is being made with randomized trials and recently published consensus contouring guidelines, although there remains no consensus on the optimum treatment paradigm. Patchell R, Tibbs P, Walsh J, et al. 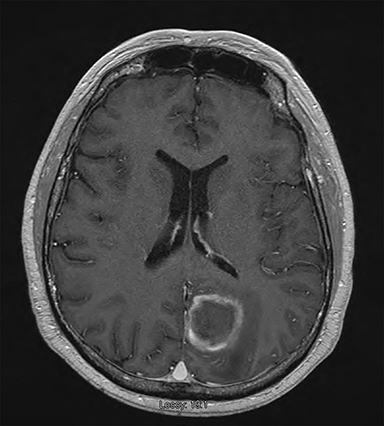 A randomized trial of surgery in the treatment of single metastases to the brain. N Engl J Med. 1990;322(8):494-500. Patchell R, Tibbs P, Regine W, et al. Postoperative radiotherapy in the treatment of single metastases to the brain: a randomized trial. N Engl J Med. 1998;280(17):1485-1489. Chang E, Wefel J, Hess K, et al. Neurocognition in patients with brain metastases treated with radiosurgery or radiosurgery plus whole-brain irradiation: a randomized controlled trial.Lancet Oncol. 2009;10(11):1037-1044. Kocher M, Sofietti R, Abacioglu U, et al. 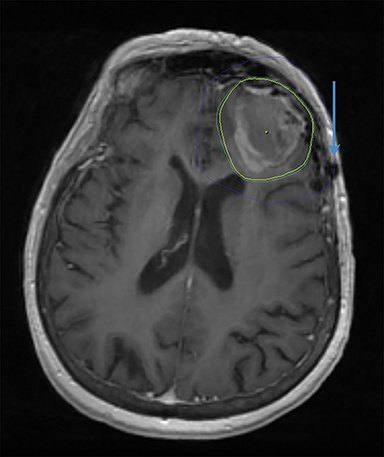 Adjuvant whole-brain radiotherapy versus observation after radiosurgery or surgical resection of one to three cerebral metastases: results of the EORTC 22952-26001 Study. J Clin Oncol. 2011;29:134-141. Brown P, Jaeckle K, Ballman K, et al. Effect of radiosurgery alone vs radiosurgery with whole brain radiation therapy on cognitive function in patients with 1 to 3 brain metastases: a randomized clinical trial. JAMA, 2016;316(4):401-409. Soffietti R, Kocher M, Abacioglu U, et al. A European Organization for Research and Treatment of Cancer phase III trial of adjuvant whole-brain radiotherapy versus observation in patients with one to three brain metastases from solid tumors after surgical resection or radiosurgery: quality-of-life. J Clin Oncol. 2013;31(1):65-72. Brown P, Ballman K, Cerhan J, et al. Postoperative stereotactic radiosurgery compared with whole brain radiotherapy for resected metastatic brain disease (NCCTG N107C/CEC•3): a multicentre, randomised, controlled, phase 3 trial. Lancet Oncol. 2017;18(8):1049-1060. Kepka L, Tyc-Szczepaniak D, Bujko K, et al. 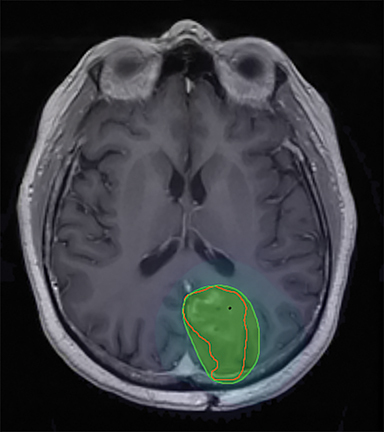 Stereotactic radiotherapy of the tumor bed compared to whole brain radiotherapy after surgery of single brain metastasis: results from a randomized trial. Radiother. 2016;121(2):217-224. Regine W, Huhn J, Patchell R, et al. Risk of symptomatic brain tumor recurrence and neurologic deficit after radiosurgery alone in patients with newly diagnosed brain metastases: results and implications. Int J Radiat Oncol Biol Phys. 2002;52(2):333-338. Soliman H, Ruschin M, Angelov L, et al. Consensus contouring guidelines for postoperative completely resected cavity stereotactic radiosurgery for brain metastases. Int J Radiat Oncol Biol Phys. 2018;100(2):436-442. Choi C, Chang S, Gibbs I, et al. Stereotactic radiosurgery of the postoperative resection cavity for brain metastases: prospective evaluation of target margin on tumor control. Int J Radiat Oncol Biol Phys. 2912;84(2):336-342. Sharieff W, Mulroy L, Weeks A, Mansoor S, Pahil R, Islam M. Scalp seeding post craniotomy and radiosurgery for solitary brain metastasis: a case report and systematic review. Cureus. 2017;9(3):e1083. 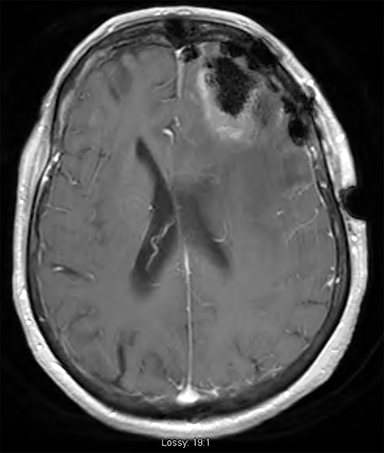 Qiu J, Cui Y, Sun L, Zhu Z. Subcutaneous metastasis after three surgeries for brain metastasis from lung cancer: a case report and review of the literature. Mol Clin Oncol. 2016;5(6):697-700. Sarma D, Wang J, McAllister M, Wang B, Shehan J. Possible implantation carcinoma of the scalp following craniotomy for metastatic renal cell carcinoma. Dermatol Online J. 2008;14(6)20. Patel KR, Burri SH, Boselli D, et al. Comparing pre-operative stereotactic radiosurgery (SRS) to post-operative whole brain radioation therapy (WBRT) for resectable brain metastases: a multi-institutional analysis. J Neuro Oncol. 2017;131(3):611-618. Prabhu RS, Patel KS, Press RH et al. Preoperative vs postoperative radiosurgery for resected brain metastases: a review. Neurosurgery. 2019;84:19-29.
https://clinicaltrials.gov/ct2/show/NCT03741673. Accessed February 19, 2019. O’Sullivan S, Keys M, McDermott R, Fitzpatrick D, Armstrong J, Thirion P, Faul C . Scalp seeding after resection and stereotactic radiosurgery for solid tumor brain metastases . Appl Rad Oncol. 2019;8(1):41-44. Dr. O’Sullivan and Dr. McDermott are clinical research fellows with St. Luke’s Institute of Cancer Research (SLICR). Dr. Keys is a clinical research fellow with Aspire at St. Luke’s Radiation Oncology Network. Dr. Fitzpatrick, Professor Armstrong, Dr. Thirion, and Dr. Faul are consultants in radiation oncology specializing in stereotactic radiotherapy, all at St. Luke’s Radiation Oncology Network, Dublin, Ireland. Disclosure: The authors have no conflicts of interest to disclose. None of the authors received outside funding for the production of this original manuscript and no part of this article has been previously published elsewhere.